From voaspecialenglish.com | facebook.com/voalearningenglish Havre de Grace is a town in the American state of Maryland. It sits close to where the Susquehanna River meets the Chesapeake Bay. Captain Bob Jobes goes fishing in these waters. BOB JOBES: "A bushel of crabs, fresh out of Chesapeake Bay today." This part of Maryland is famous for its wildlife. Havre de Grace is also known for a different kind of bird: Captain Jobes is is one of the top decoy carvers in Havre de Grace. BOB JOBES: "It was just growing up as a kid, learning a skill how to do this. I got two brothers that carve, my son carves, and my father. Yeah. Three generations carving decoys." Hunters use decoys to get ducks and geese to come close enough to shoot. The wooden birds are so highly respected here that Havre de Grace calls itself the decoy capital of the world. It also has a museum with more than 1,000 decoys. Most were hand made in the Chesapeake Bay area. John Sullivan is director of the museum. JOHN SULLIVAN: "Approximately 14,000 visitors come here each year. We have visitors from all over the United States and all over the world." Henry Miner came from the Chicago area to see the decoys. HENRY MINER: "I particularly like the older ones, the very first style - and anything that's wood because nowadays everything is plastic or foam or ... so they're all pretty neat to look at." The demand for decoys rose in the middle of the 19th century because of a device called a sink box. Hunters would hide in the middle of these floating structures, surrounded by decoys. 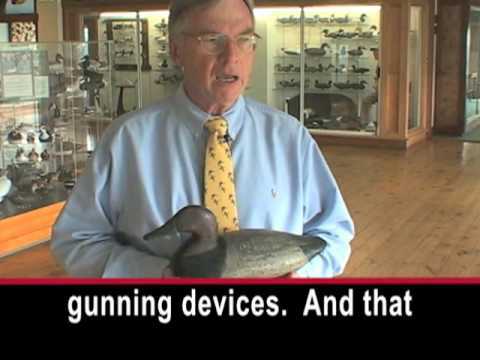 JOHN SULLIVAN: "You would use from 200 to 500 decoys around these gunning devices. And that demand put a lot of the housepainters and carpenters in the business of producing decoys." The sink box was banned in 1935 and the demand for decoys dropped. The wooden birds became American folk art. BOB JOBES: "People were collecting decoys, and we were selling so many decoys that we could just solely make our living off of carving. It's changing a little bit now, with the economy." Decoys are beloved in Maryland. They sit in restaurants, store windows and in houses, including the home of Mitch Shank. MITCH SHANK: "It was made in 1955 by my grandfather, R. Madison Mitchell. This is a special one. This is the year that I was born." Madison Mitchell was the most productive decoy maker in Havre de Grace. Shank started collecting decoys as a young man, when he worked for his grandfather. MITCH SHANK: "In Havre de Grace, if you drove around town and knocked on a door, most of the houses would probably have at least one decoy." There are many at Vincenti Decoys. Jeannie Vincenti has operated the business for 17 years. JEANNIE VINCENTI: "Well our customers are local people who are aware of the tradition. There are also tourists that come in and don't understand quite exactly what a decoy may be, but then when they come in they find something in the store that they really like and consider a treasure." She says decoys can cost from 50 to several thousand dollars. This antique decoy is priced at almost 5,000 dollars. Vincenti also sells wood carving supplies. JEANNIE VINCENTI: "There are younger people coming into it every day. Is it the number that we saw years ago? Probably not." Vincenti hopes more young people become decoy carvers so the tradition will continue in Havre de Grace. I'm Faith Lapidus. Будем рады, если вам понравилось видео 'Decoy Capital' Finds Real Appeal in Fake Birds. I like this kind of videos recorded in the towns. Special thanks for the staff of VOALearningEnglish, these videos are useful for those who want to learn? this language. once again Thanks a lot, Regards from NICARAGUA!